A Brand New Burns, Part One! Slobodan Milošević was the President of Serbia and of Yugoslavia. 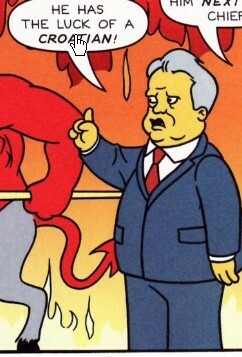 Milošević is one of the residents of Hell and helps Satan try and get Charles Montgomery Burns to Hell. Comic story – A Brand New Burns, Part One! Modified on September 19, 2016, at 12:17.